Połączenie z Morrisem - powstał British Motor Corporation. Produkcja A40 Devon właśnie się zakończyła. Łącznie powstało 456.544 sztuk A 40 w wersjach 4-dr Devon i 2-dr Dorset. Następca A40 Somerset pojawił się w sprzedaży w lutym. Stylizowany podobnie do A70, jest od niego mniejszy i skromniej wyposażony. Skórzana tapicerka dostępna jest jako standard, ale ogrzewanie i daszek przeciwsłoneczy stanowią wyposażenie dodatkowe. Wersja convertible pojawiła się we wrześniu. Nowy model występuje też jako sportowy kabriolet budowany u Jensena. Został on zaprezentowany 8 miesięcy po wersji podstawowej. A 40 Devon was end of prod. 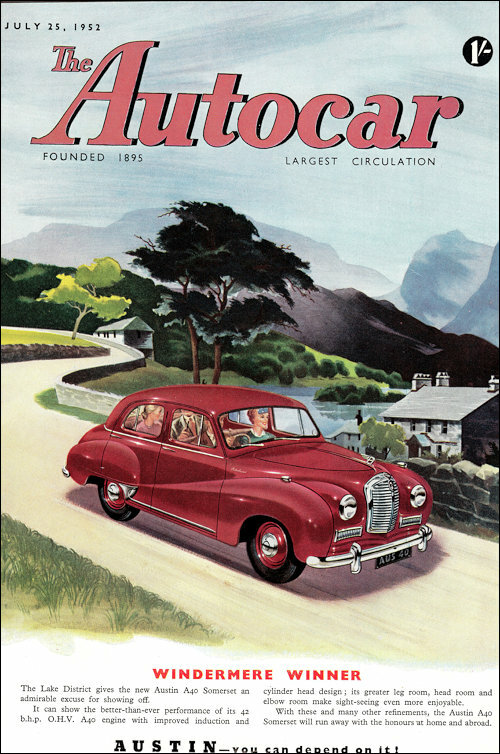 in early 1952, over 456,544 A40s had been produced; 77% of these had been exported, earning £88 million in foreign currency. 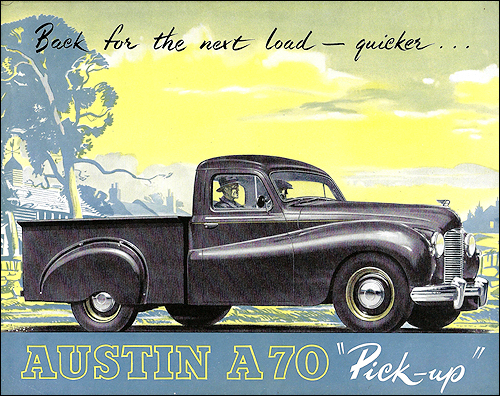 Agreement for Nissan to build and sell Austins in Japan under the Austin name. 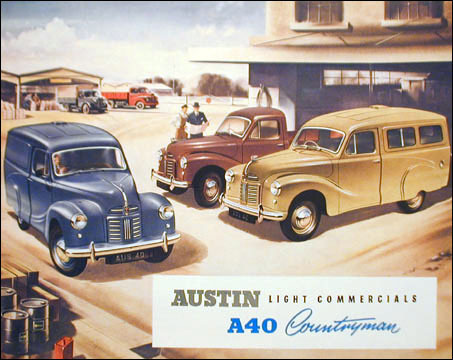 Austin A30 Model AS3 Saloon started its production run in October 1951. 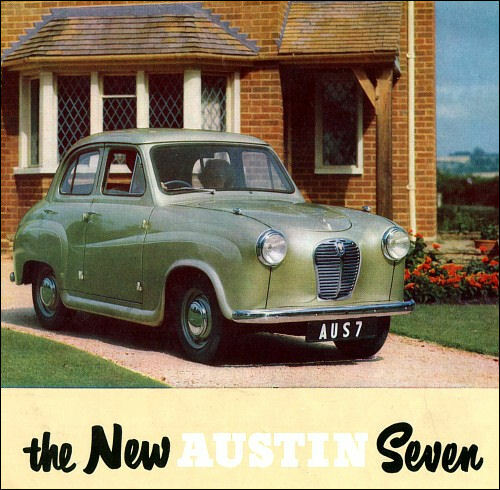 Of conventional layout it features an 803-cc 28-bhp, OHV Four engine, four-speed gearbox, hypoid-bevel final-drive, coil-spring IFS and semi-elliptic leaf-spring rear suspension, and is the first Austin to use the chassisless integral construction format. 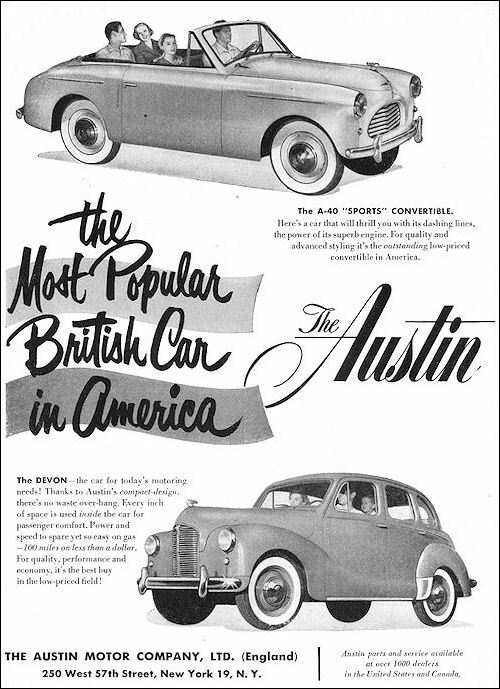 It sold at £529 and is designated Austin Seven. 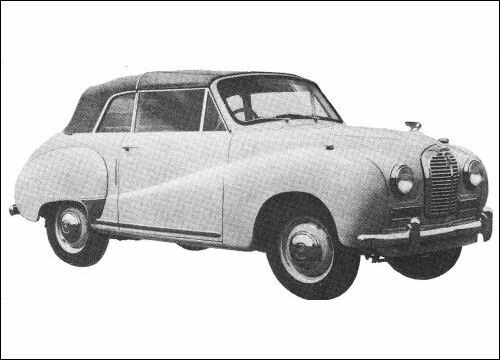 Austin A40 Somerset Model GD5 Drophead Coup é joined the saloon in August 1952. 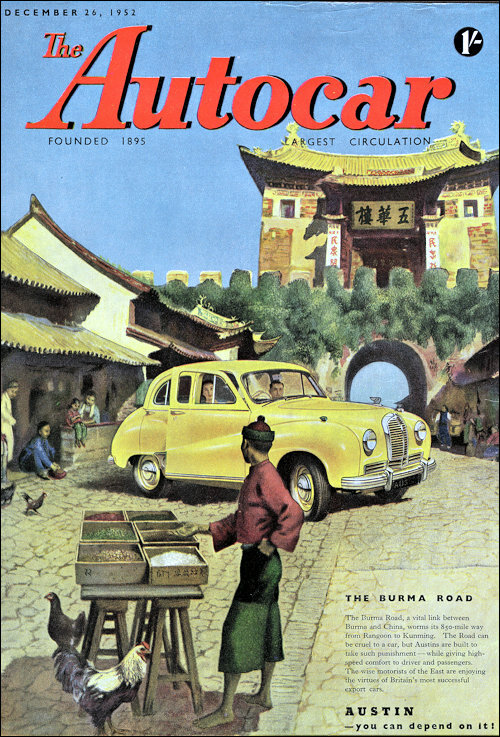 It have similar dimensions to the saloon except that the overall height is slightly less. The top could be used in three positions, i.e. 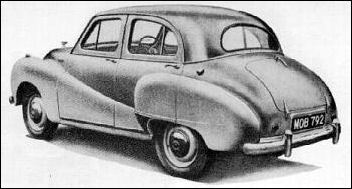 fully raised, 'Coupé de ville' or stowed behind the rear seat. 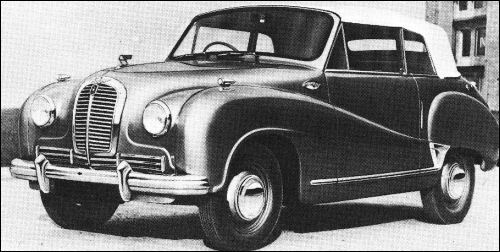 The rear quarter windows could be swivelled down into the body sides. The top is operated manually on this model, although power operation is available at extra cost. 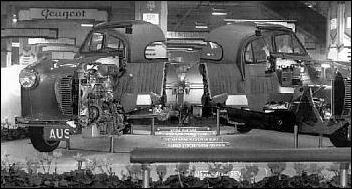 Built by Carbodies. 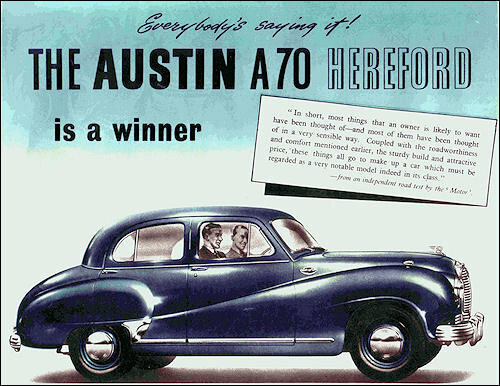 Austin A70 Hereford Model BD3 Drophead Coup é look much like its A40 counterpart but is larger. 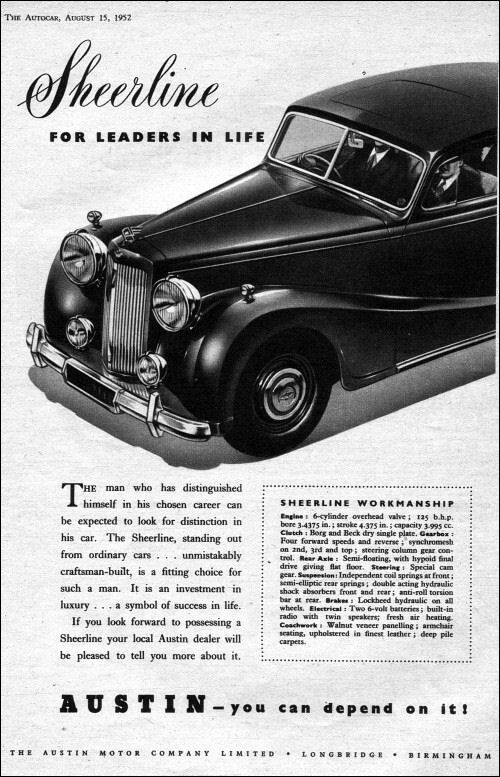 Built by Carbodies it was discontinued in July. 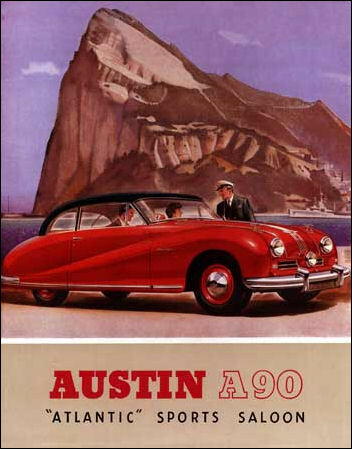 Introduced in 1948 A 90 and made initially in drop head form as a Dollar earner, it was a resounding flop across the Atlantic with many cars brought back home. 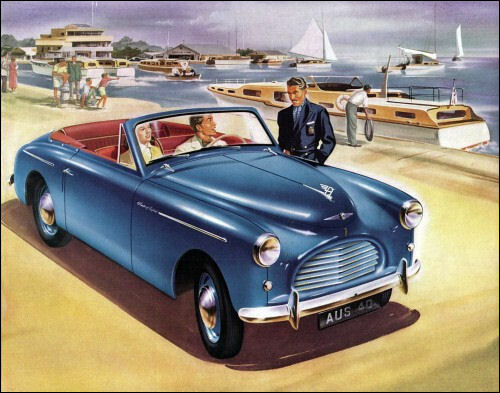 This engine formed the basis of the Healey 100 introduced in 1952. 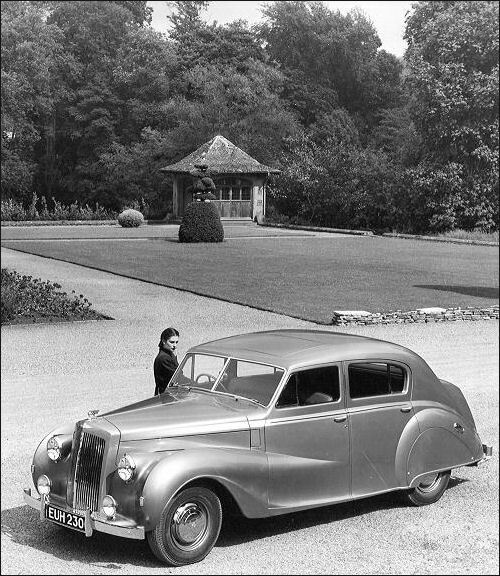 The first of the Austin Princess Limousines was exhibited at Earls Court in 1952 and the first two production models were purchased by her Majesty the Queen. 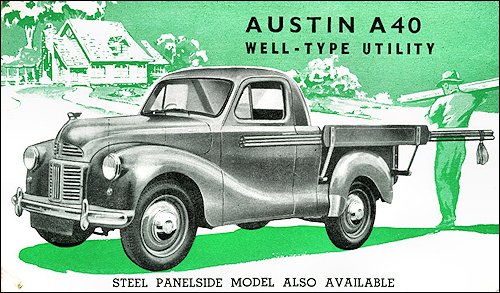 The production of the Truck 1/4 Ton 4x4 CT was given to Austin Motor Company in 1951 with the Contract 6 VEH 5531 by the British Army, signed on 1 August 1951 for 15000 vehicles. The probuction is located in the factory at Cofton Hackett near Birmingham. Champ is also available for civilian market.